SEOUL -- TEMIXYS, a biosimilar developed by South Korea's leading biopharmaceutical venture group Celltrion to treat the human immunodeficiency virus, has won U.S. approval. Sales in the U.S. market will begin in early 2019. Celltrion said the U.S. Food and Drug Administration (FDA) has approved the TEMIXYS tablet, an incrementally modified drug based on Zeffix by GlaxoSmithKline Plc, a British pharmaceutical company, and VIREAD by Gilead Sciences, an American biotechnology firm. The South Korean company said its new tablet would compete with Truvada, a medication used to treat and prevent HIV or AIDS. 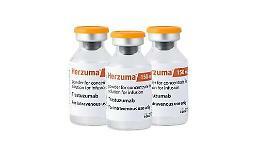 Celltrion has produced biosimilars such as Herzuma, used to treat breast cancer based on Herceptin developed by Genentech, a subsidiary of Swiss pharmaceutical giant Roche, and Remsima, a copy of Janssen Biotech's Remicade treating rheumatoid arthritis and Crohn's disease. Truxima, a biosimilar used to treat patients with non-Hodgkin's lymphoma, chronic lymphocytic leukemia and rheumatoid arthritis, is also popular in Europe.